Liturgy Solutions just posted a copy of the Introit that will be sung at the conference Divine Service. Let Cantor Magness know if you’d like to participate in the choir this year. And let your choir director know about this resource. Just think, your choir could sing the same setting of the Introit the next day back at your home congregation, bringing a taste of the conference to your own parish. 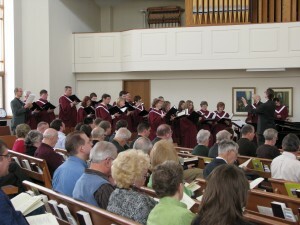 Also to be sung at the conference is a setting of Psalm 30 by Stephen R. Johnson, led by the conference choir. At the end of the service, we’ll all sing A Mighty Fortress, with the choir singing a special arrangement of the third stanza by Jeffrey Blersch. These pieces are also available through Liturgy Solutions. If you want to join the choir, you will be sent a copy of the music for the event and are expected to practice it before the weekend. 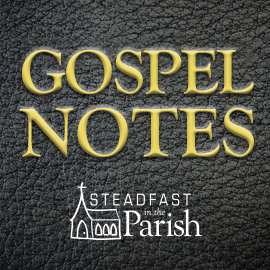 You will also have to miss the last 15 minutes or so of Pastor Bryan Wolfmueller’s presentation; you are asked to join the choir for practice 30 minutes before the Divine Service. Check the schedule here for more information. Whether you sing in the choir or not, be ready to sing your hearts out: the Divine Service will be almost entirely a cappella this year. We’ll have organ and brass for Vespers Friday night, but the Divine Service will model a service without organ, to encourage brothers in parishes with limited musical resources and uphold the voices of the baptized as the singers of the Lord’s song. If you’ve never sung DS III (LSB) a cappella before, be ready for a treat. You will be renewed in your appreciation of liturgy and hymnody as the folk song of the Lutheran church. Be sure to register now if you haven’t yet done so. There are quite a number of events you won’t want to miss; click here for more information. Thanks for the post. I’m really looking forward to joining the choir again this year. A special thanks to Cantor Magness for allowing us the opportunity to join our voices with those of the wonderful choir members there at Bethany. Interestingly, I had an opportunity to sing the DS III from the LSB a cappella a couple of years ago while on an elders visit to the home of Cliff, a member of our congregation who was dying. While I wouldn’t call it a treat, it was very moving. His wife had sked me to come sit with him so she could have some time to have a meal with visiting family members who were awaiting the inevitable. I don’t know why, but I grabbed a copy of the hymnal when I left to go to their house, and when I got there, not knowing what else to do, I opened it up the DS III and began to quietly sing it to Cliff. 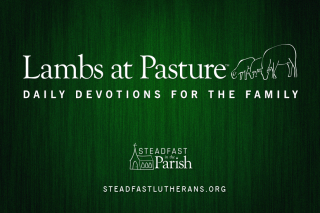 After a short while his wife, Lee, stuck her head in the room to see what was going on, and she soon joined it, suggesting hymns and scripture readings. Before long the entire family was joining in. Is was really nice, because almost everyone had grown up with that liturgy and could join in without having hymnals of their own. It was a great testement to the value of the unity we had in Liturgical worship. Inspirationally infuse mind-blowing financial sustainability.